Decisions and actions taken by supervisors and managers must be documented on the BlueTeam running sheet. Members of any rank must register on BlueTeam any complaint made to them; and any other matter as required by Abacus procedures. The Registration Flowchart Overview and the Abacus Flowchart may assist with this section. Preliminary assessments are undertaken by a supervisor following registration of a matter on BlueTeam. It may involve fact checks on data holdings (Integrated Data Management (IDM), INTREPID Central Enquiry (ICE), Automatic Vehicle Location (AVL) etc.) to assess the validity of basic claims in the complaint; or contact with the complainant or the subject officer (unless the matter is serious and contact with the subject officer may jeopardise later investigation). The purpose of preliminary assessment is to assist with the prompt categorisation and resolution of the matter. It does not amount to an inquiry or investigation. If it is a level 2 or 3 matter the supervisor is required to ensure the complainant statement has been obtained, or arrangements have been made for it to be obtained, and any exhibits secured. All matters registered on BlueTeam require validation by a member who is senior to the reporting member – similar to the Offence Reporting System (ORS2) and Family Violence Management System (FVMS). This process allows a check and balance of the categorisation selected by the registering member. If one complaint or internally raised matter contains several allegations which fit into more than one category, then the highest category is to be selected on the BlueTeam entry. If the supervisor believes the categorisation level is incorrect they should note this on the BlueTeam transmission ‘instructions’ to the manager and request the matter be recategorised. If the supervisor assesses the matter as a level 1 matter, if appropriate they can resolve it by taking appropriate action (e.g. informal resolution or formal resolution). This step is intended to prevent the past practice of minor matters being over-investigated. Validation occurs when a supervisor (and subsequently a manager) selects “approved” against the matter on BlueTeam and routes it onwards. Note: “approved” does not necessarily mean that they approve the contents; rather it is a system requirement to allow the matter to be moved onwards. Where a supervisor or manager identifies mistakes, omissions or issues on the BlueTeam entry they should continue to route the matter through the chain of command to Professional Standards to meet the required timeframes. The mistakes, omissions or issues should be documented on BlueTeam and the member responsible informed to ensure that the mistakes, omissions or issues do not occur in the future. Managers must give consideration to whether or not some complaints or internally raised matters should, more properly, be made under the Public Interest Disclosure Act 2002 if it involves improper conduct as defined under that Act. If the matter is assessed as such then it should be managed in accordance with the procedures described here. The reporting member should be informed that their matter can be managed under that legislation. Any investigation that follows may or may not be handled as an Abacus investigation: due to the protections provided, including anonymity provisions, these matters can be reported in many ways and do not have to be registered on BlueTeam. The manager may determine that such a matter should not be recorded on BlueTeam. If it has been recorded on BlueTeam the manager can contact Professional Standards and request a high-level security access be applied, or alternatively, that the matter be removed. For public interest disclosure matters that are to be dealt with under Abacus, and for all other matters, the process detailed below applies. 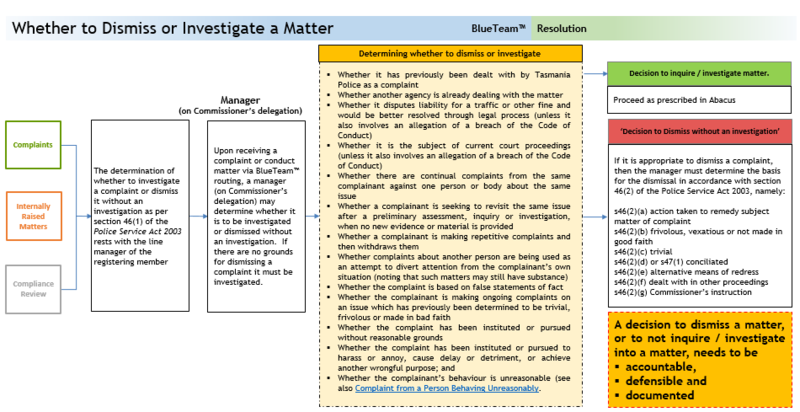 Upon receiving a complaint or conduct matter via BlueTeam routing, a manager (on Commissioner’s delegation) may determine whether it is to be investigated or dismissed without an investigation. If there are no grounds for dismissing a complaint it must be investigated. any other matter the Commissioner considers appropriate. If a member dismisses a complaint, they must ensure that they maintain appropriate records in relation to their decision-making. A member delegated this responsibility is representing the Commissioner and their decision is seen to be the decision of the Commissioner – and cannot be overturned. A decision not to investigate a matter, or to dismiss it, needs to be accountable, defensible and documented. Decisions and actions taken by managers must be documented on BlueTeam. If one complaint or internally raised matter contains several allegations which fit into more than one category, then the highest category is to be selected on the BlueTeam entry. If this was not done by the registering member, the supervisor might have identified it in the transmission note. If the manager believes the categorisation level is incorrect they should note this on the BlueTeam transmission ‘instructions’ to Professional Standards and request the matter be recategorised. whether the matter involves discrimination, particularly of a racial or ethnic nature (racial and ethnic aspects are often broader than the formal allegations) and, if so, the matter may prima facie be classified as a level 2.
where the matter alleges corruption or the commission of a serious offence or crime. This list is not exhaustive – it is provided as a guide to the types of consideration that may bear upon the categorisation. The Professional Standards vetting process will resolve any categorisation issues. Where a matter has been categorised on the basis of repeated behaviour, managers are to record this on BlueTeam. If managers are unaware if the member has been the subject of similar allegations previously, they should categorise the matter on face value and record a request on the BlueTeam routing for Professional Standards to check the subject officer on IAPro for matters involving similar alleged behaviour (Professional Standards may then recategorise it if appropriate). 7.5.4. Deciding Nature of Inquiry / Investigation: Code of Conduct or Criminal? Managers are to decide whether the matter is to be dealt with solely as a Code of Conduct matter, or as an offence, serious offence or crime, or both. This is to be determined on a case-by-case basis and may necessitate the seeking of advice from Professional Standards. If legal advice is required it is to be facilitated by Professional Standards unless otherwise approved by the Deputy Commissioner. Once a BlueTeam matter is validated, the manager is to route it to Professional Standards. Professional Standards then vet it for appropriate categorisation. It is anticipated that managers will properly categorise a matter and that recategorisation by Professional Standards will rarely need to happen. Once a decision is made to investigate a complaint, or dismiss it without investigation, the manager is responsible for sending an acknowledgement letter to the complainant. If a complaint is accepted for investigation the complainant will receive an acknowledgement letter (refer template letter) that restates the behaviour they have complained about. This ensures Tasmania Police and the complainant are agreed on the specific behaviours that are subject to complaint. For complaints that are dismissed without investigation, the legislative basis for the dismissal must be provided in the acknowledgement letter. Vetting is a simple administrative process that is essential for maintaining consistency across the organisation. Professional Standards will check subject officers on IAPro for matters involving similar alleged behaviour and may recategorise a matter if appropriate. For example, if a member is alleged to have used abusive language to members of the public on several separate occasions then a matter that on its own would have been a level 1, will instead be a level 2. If Professional Standards is of a view that a matter has been incorrectly categorised, it will be discussed with the relevant District Commander and a categorisation decision will be made through consultation between the two commanders. Once categorisation is confirmed the matter is released into the IAPro system, at which point a reference number is automatically applied. Professional Standards will conduct audits of matters that have not been released from BlueTeam on a random basis. This will be focussed on ensuring the timeframes for registration are met. Pursuit 1 matters will be closed. Information Only matters may be filed during the vetting process or may be sent to the member’s district to seek clarity or further information. Complaint 1, Equity and Diversity 1 and IRM1 are allocated to the member’s district for managerial resolution. Equity and Diversity 1 matters may be handled by the Equity and Diversity Coordinator. 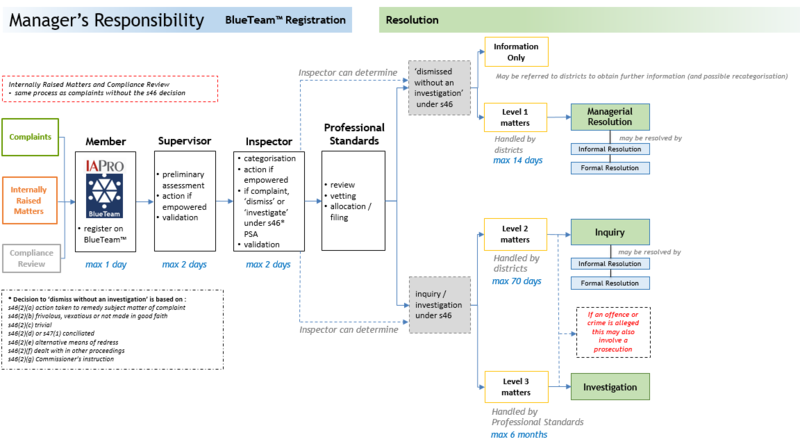 Level 2 matters are typically allocated to the member’s district for proportionate inquiries (but in some circumstances may be allocated to Professional Standards). Level 3 matters are allocated to Professional Standards for investigation (unless otherwise directed by the Deputy Commissioner). In some matters there may be a requirement to implement an administrative measure while the inquiry or investigation is underway for safety, risk management, legislative and other reasons. These measures do not constitute section 43(3) Actions and are not considered to be an outcome of the matter and do not form part of a member’s conduct history. They are practical measures taken in the interests of all parties prior to resolution of the matter. Interim administrative measures include a member being seconded to another position or area; or their duties altered to a ‘non-operational’ role. ‘Non-operational’ refers to members who are working in roles that are office-based or station-based and have no requirement to wear accoutrements as their role does not involve physical interactions with members of the public in a typical frontline policing sense. Unlike standing down and suspension, the term ‘non-operational’ does not have any application to the Police Service Act 2003. Decisions of this nature will require the approval of a commander or the Deputy Commissioner. A member who receives a Police Family Violence Order is required to change to non-operational duties due to the firearm-related condition on the order. A member subject to an Equity and Diversity complaint is seconded to another area to facilitate resolution of the matter. The Commissioner may stand down a police officer from duty for any reason and for any period not exceeding 7 days the Commissioner considers appropriate. The Commissioner, by notice served on the police officer, must notify the police officer of the stand-down. A stand-down takes effect on service of the notice. The Commissioner may revoke a stand-down. Section 39 states that a member who is stood down from duty is to be paid their usual remuneration and allowances; and are not entitled to exercise any power, or perform any of their duties during the period of being stood down; and are subject to any direction of the Commissioner. If a subject officer is stood down, the period cannot exceed seven days. The subject officer would return to duty, unless suspended. If a member is served with a stand-down notice at 4pm on 1 July, the seven days expires 6 days later at midnight on 7 July. The service of a suspension notice might lead to an overlap with a stand-down notice. Whilst the Commissioner may determine to suspend someone on, for example, day 3 or day 4 of a stand-down, it does not take effect until served. After a police officer has been stood down under section 38, the Commissioner may suspend the police officer from duty for any reason and for any period the Commissioner considers appropriate. The Commissioner, by notice served on the police officer, must notify the police officer of the suspension. A suspension takes effect on service of the notice. The Commissioner may revoke a suspension. Section 41 states that a member may be suspended with or without their usual remuneration, allowances (or both) and are not entitled to exercise any power, or perform any of their duties during the period of suspension; and are subject to any direction of the Commissioner. This page -- https://www.police.tas.gov.au/about-us/abacus/7-responsibilities-registration-process/ -- was last published on March 1, 2018 by the Department of Police, Fire and Emergency Management.